E-Waste Experts, Inc. has earned an R2:2013 certification from an authorized third party auditor. The R2 certification verifies that companies like E-Waste Experts, Inc. adhere to the Responsible Recycling Practices ‘R2’ which are fully endorsed by the US EPA. These practices were developed to ensure that the toxic components of electronic waste (e-waste) are properly recycled and that the illegal export and dumping of e-waste does not occur. E-Waste Experts, Inc. operates in Bristol, PA under the authority and supervision of the PA Department of Environmental Protection (PA DEP). 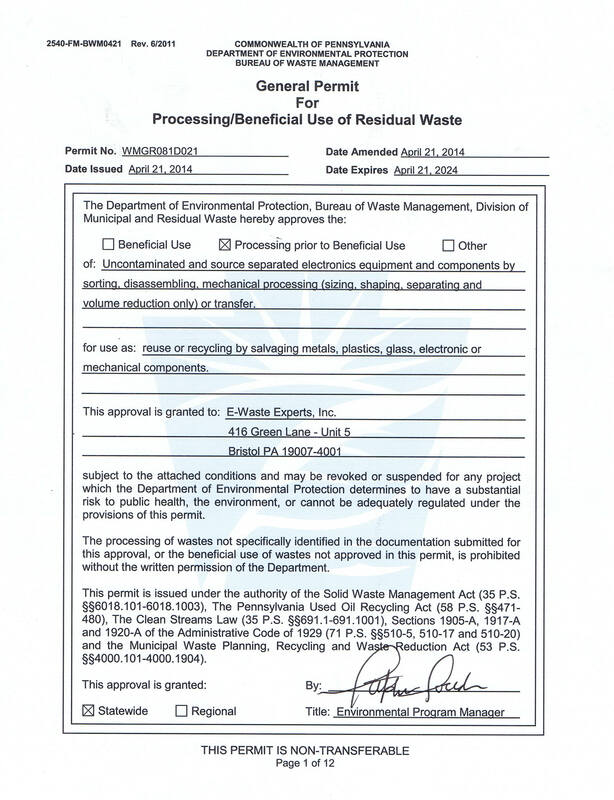 The company has been issued Beneficial Use Permit WMGR081D021 by the PA DEP which allows it to legally accept and demanufacture e-waste. The company legally processes e-waste from all 50 states and Canada at it’s permitted facility in Bristol, PA.
E-Waste Experts, Inc. has earned an ISO 14001 certification from an authorized third party auditor. The ISO 14001 addresses various aspects of environmental management. It identifies and controls our environmental impact and helps constantly improve our environmental performance.